In this bold award-winning memoir, Edinburgh-based author and journalist Chitra Ramaswamy delves into the exciting – yet also at times confusing and overwhelming – experience of pregnancy. 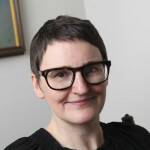 In a series of intimate essays she charts the many changes to her body and mind while challenging the wider perception, and portrayal, of pregnancy in society. In this frank introductory extract, Chitra confronts pregnancy’s ‘riddle’. An unremarkable Sunday morning in November. A noirish time of year when nature’s reel turns monochrome and the world becomes as smudged and grainy as old newsprint. Sombre November, as TS Eliot called it. The last gasps of another year. On the morning dog walk the leaves were pockmarked from an excess of autumn and had lost their florid complexion. They were beginning to blacken now and stick to my shoes as though slick with a thin layer of oil. It was the eleventh month of the year, though Novem means nine for it was the ninth month in the Roman calendar. Nine months. A clue dropped by a season, like so many leaves. And so with all this promise of death I found myself taking a test proposing life. A frightening test, though perhaps there is no other kind. A test taken by oneself in the privacy of one’s own bathroom towards the end of another year. A test whose result is revealed not by a mark on a page but by a stream of one’s own bog-standard urine. A test for which there are only two results. Either life is there, burrowing in a place as close to you as your own heartbeat yet as mysterious as the inside of a mountain, or it is not and life, the other kind, goes on. How very simple. And how brutal too. Like however many millions of women before me and who knows how many in tandem, I squatted, hovered, took aim and waited for a blue cross to materialise in a tiny window of possibility. I had done this a few times in my life. In Glasgow in my early twenties when my partner at the time had just moved to London and I felt vengeful and very alone. The result? Relief. Or more recently in Soho, in one of the new breed of budget design hotels characterised by receptions without people and rooms without windows. That time? Disappointment. On both these occasions, the result had been negative. Life, the other kind, had gone on. This time was different and as is often the case with major moments, I knew before I knew. I had eaten oysters twice in the previous week – unusual in itself and almost willful in retrospect – and felt seasick as each sup slid down my throat. I had drunk whisky, smoked roll-ups and sung along to the Proclaimers in Edinburgh’s The Port O’ Leith, a floating pub, which in its own salty way is no less glamorous than sipping Bellinis in Venice or going for bagels in New York. But instead of feeling the euphoria that comes from belting out ‘sorrrrroooowwww’ with the bonfire of Laphroaig on your breath and the scent of the Firth of Forth on the air, I felt jittery. Five days previously, there had been a small rusty mark on a pair of pants, a question mark written in blood. It was enough of a hint for me. And yet I had cause to doubt what is known in the business of trying to conceive – and one soon discovers that it is first and foremost a business – as an implantation bleed. That is, the moment when the ball of cells that goes by the dramatic name of a blastocyst burrows into the wall of the uterus, the most minuscule of plants taking root and making the ground shed tears of blood in response. Little blastocyst blasting its way into the world, so small and uncertain it has yet even to become embryonic. My partner and I had been trying to make this everyday miracle happen for almost eighteen months. It had not been easy for us. We were two women for a start. The story was the kind of romantic comedy that would never get made, with all the madcap races across cities and highly charged encounters in hotel rooms you might expect. Stories that were good for dinner parties but bad for life. We had already done so much. Our preparation had been flawless; all we lacked was an outcome. To start, a civil partnership to ensure we would both be the parents of a baby that might never be, a leap of faith that no heterosexual couple is required to make. Bizarrely, this needed to take place not just before birth but before conception, making the most private of acts a matter of public interest from the outset. And so it went on. Three donors and three corresponding excruciating encounters up and down the country. Home insemination kits bought off websites with deflating names like prideangel and fertilityzone. Blood tests at the GP’s to ensure I was fertile. Dispiriting monthly trips to buy yet more ovulation tests, cruelly addictive (and expensive) little sticks that so resembled pregnancy tests I began to feel dumbly thrilled when they showed up positive. Then a growing obsession with donor profiles on international cryobank sites, where you can buy sperm by the syringe and have it delivered to you in a hissing nitrogen tank, which if nothing else sounds like the birth of a post-modern superhero. And finally, a number of exchanges in a series of hotels with neither windows nor souls. Every month, these brief encounters grew at once more workaday and strange. They began to gain an air of desperation, of waning passion and lost faith, sentiments that afflict most clandestine hotel trysts in the end. And the fact was they weren’t working. Like November, we remained sombre, in limbo, aching for our lives to turn Technicolor, to end and begin again. The frustration that comes when your body refuses to submit to your will grew exponentially, fattening like the foetus it seemed would never be. Meanwhile I grew increasingly defiant towards my own flesh and blood. I knew my body less and less with each passing month, just as we slowly grow to see a partner we no longer love as a stranger. To fail to get pregnant when one badly wants to is to engage in the most treacherous kind of battle: with one’s own innards. We can no more will a baby into our bodies than we can draw an illness out of them. Now I waited once more. Watched the beads of condensation on the cistern as they trembled, brimmed over and wept. Listened to the pigeon that had taken up residence outside our bathroom window for much of the autumn cooing with the persistence of a clock. Pictured Claire, my partner of eight years, a few feet away in the sitting room with the dog curled at her feet, waiting too. Witnessed the world distil itself, telescoped by anticipation into a chain of beautiful moments. Like words, life has a way of becoming poetry when slowed down. You must wait three minutes before reading a pregnancy test. The length of a pop song or an ad break. During this time I found myself feigning nonchalance for the benefit of no one but myself, imagining a camera lens hovering above my head as we do when we sense something monumental is afoot. I left the bathroom, paced our hall, allowed myself a Hitchcockian moment of suspense with all its long shadows and discordant strings, and then returned to the scene on which the plot of my life suddenly hinged. Finally I allowed myself a close-up. There it was. The revelation I had been imagining for so long. A moment not entirely unlike the adverts on television with their staunchly white couples flashing white teeth against white backgrounds, making fertility look oddly sterile, as innocent as ordering a salad for lunch. The vertical line was a little less significant than the horizontal, but it was a blue cross nonetheless. And beside it, an idiot’s guide to deciphering the message. + = pregnant. – = not pregnant. A turning point, the kind that is mammoth enough to be experienced twice. First as raw moment, all heartbeat and terror. Second as story: dramatised, edited and reconstructed even as it unfolds. ‘I’m a riddle in nine syllables,’ wrote Sylvia Plath in her 1959 poem ‘Metaphors’. Nine syllables. Nine lines. Nine months. The arc of pregnancy, with its triptych of trimesters, is as meticulously structured as a poem. Though, of course, one cannot break free of the conventions of pregnancy. There is no way to subvert its stanzas. Plath wrote these blackly humorous lines that peter out into quiet desperation when she was pregnant with her first child. The poem is funny in a cruel way: the joke is on her, and on all pregnant women who are reduced to mere metaphors as they rise like yeasty loaves. Plath would remain as ambivalent towards motherhood as she was towards pregnancy for the rest of her short life. How could she not be in a decade when the word itself was riddled with shame? When a pregnant woman was still a walking euphemism? In a family way. In a delicate condition. With child. Enceinte. Expecting. Plath understood the tricksy nature of pregnancy, its deep and perplexing riddle, its silence as dark as the womb. She understood its peculiar contradiction: the problem of how you can be at your most lonely during the one time in your life when you are never alone. In philosophy the exploration of how a being relates to its world is known as the problem of self. Just think how this problem doubles, trebles, multiplies when there are at least two people inside one body. Plath understood what it was like to all of a sudden, after living with such unthinking ease in one’s own body, feel like ‘a means, a stage, a cow in calf’. She understood the wondrous absurdity of it. She made sense of pregnancy by travelling beyond experience to a place where only metaphor would do. Plath’s attempt was to write about pregnancy by not writing about it, by veiling it, perhaps even illuminating it, with metaphor. It was all too lonely a place to live in the end. She was imprisoned in the bell jar, an image that in its own way recalls pregnancy too. After all, pregnant women often feel trapped in their bodies, or rather their bodies become the trap. And isn’t the womb, too, a kind of jar, albeit one we cannot look inside with the naked eye, one whose contents remain unseen until the lid is opened. What, then, is the riddle of pregnancy? How are we even to begin to understand it? To find the right metaphors? Or perhaps even to abandon them: to crack open the jar and spill the contents? To cast aside the sentimentality, sanitisation, science, prescription, self-help, emotionally manipulative doggerel, lies, misconceptions, misogyny, unwanted advice, politicking, and the never-ending slew of news stories that serve only to patronise, petrify or pacify? How do we find some meaningful understanding of one of the most thrilling, challenging and alien experiences of all? To describe what it really feels like to grow a person within a person? To tell the curiously silenced story of how every single one of us began? Pregnancy. The word both sounded heavy in my mouth and suggested a kind of heaviness. It had something to do with its staccato rhythm, the way it began harshly and then finished with a soft purr, as if it were a pregnancy in reverse. It wasn’t an easy word to speak aloud, just as it wasn’t an easy experience to articulate. This made me like its awkwardness: it suited it. And what of its meaning? In Latin, praegnans translates literally as ‘before birth’. It has long had a significance reaching beyond its description of the gestation of a foetus. There is the sense of pregnancy as carrying weight, depth or meaning. The pregnant pause. The pregnant moment. The pregnant utterance. By the late fourteenth century, to be pregnant also meant to be convincing, weighty or pithy. A pregnant argument was a compelling one. Then there was its sense of fullness and creativity. Its wonderful state of potentiality. I wanted to return to this definition of pregnancy as being ripe with meaning itself. To be pregnant with meaning as much as with child. Then there was the trajectory of the thing itself. In a time when haste and choice and control meant everything, a pregnancy could not be speeded up. It was a journey characterised by its length, stubbornness and difficulty, and an ascent that had to be undertaken all the way to its peak. There was no veering off course. The journey was laid out before me: charted by nature herself. Though mountaineering seemed the most masculine of sports – the need to conquer, to get to the top and survey the world from its ceiling – here was perhaps the most challenging climb that the body could make, and it was indisputably feminine. I wanted to chart my pregnancy as one might a great journey, follow it as one might a trail. Walk the river all the way back to its source. Find a new route to the summit of Everest. My body would become a map. No, it would become the landscape itself. Its contours would be the topography, each month would become a milestone, each trimester a landmark. I might tick off rare moments with the satisfaction of a birder. I might mark months with the relish of a hiker bagging Munros. I might even enjoy getting lost. And what of birth? It would become the resting place. The end of the line. The top of the mountain. The final destination. The place where the wild things are. Later that day Claire and I went for a walk in the Hermitage, an ancient woodland straight out of a Grimm’s fairytale and the kind of sheltered place that is particularly prized in a northern city blasted by wind and haar. The kind you burrow into, which seemed apt for that other journey on which I was embarking. In fact, this twelfth-century former hunting ground would bookend my pregnancy. Exactly forty- two weeks later I would wind up back in this deep green gorge, beating the very same paths on the day I went into labour. Even in Edinburgh, where a daily commute through a medieval town carved into ice age rock makes you somewhat inured to all things old, the Hermitage feels ancient. These are surely the oldest trees in the city, as gnarled and characterful as storybook giants. Ash, beech, sycamore. Weathered, wide, Victorian in age and grandeur. Though wild boar and deer were once hunted here, these days you’re more likely to see locals in Hunter wellies calling on their Labradors, who invariably go by the name of Monty. As usual Claire and I made for an unusual couple, a sentiment so familiar it perversely made me more at home. Like all happy outsiders, I have always felt most myself in the places where I fit in the least. Well, here we were: two women, one Anglo-Indian, one Scottish, walking that most maligned and working class of dogs, the Stafforshire cross. And something else accompanying us too, a secret, a potentiality. Whenever fellow dog walkers asked a question about our dog, only one of us would be addressed, as though it were unfathomable for both of us to own her. If this was the case with a dog, how would we be seen – or rather not seen – with a baby? We wandered in a daze, barely talking. I felt that odd commingling of excitement and dread that comes with getting what you want. My belly, as flat and featureless as a field, whirled with wish-fulfilment and a sense of the unknown as our dog thundered up the slopes ahead of us in search of squirrels. Everything as it always was, everything utterly changed. I felt too jumpy even to place a hand on my own stomach, which suddenly seemed to belong to someone else. Despite my long-held belief that a woman’s rights override those of her foetus, I felt that perhaps it did. Our news was still new, as unspoken and frightening as a family secret. We were shocked by it, and this too was shocking, for how can something you’ve been planning so meticulously still surprise you when it comes off? The fact is I had been trying to conceive for so long that I had forgotten the point of it all. I was like the fisherman so stunned by the catch squirming on the end of his line that he throws it back in the water. The ritual of the rod, the river and the lure had so consumed me I had forgotten about the fish. And now that I had come to the end of the line, I realised that, like so many ends, it was only another beginning. This, too, was part of pregnancy’s riddle. 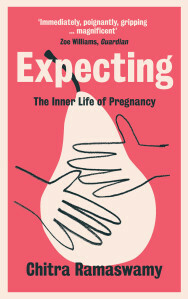 Expecting by Chitra Ramaswamy won the First Book of the Year in November 2016 at the Saltire Literary Awards and is out now published by Saraband Books priced £12.99.